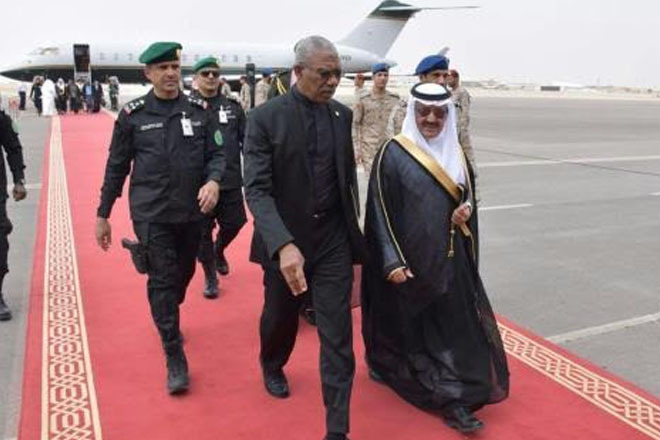 President David Granger of Guyana arrived in Riyadh, Saudi Arabia, on Saturday to join other world leaders for the Arab-American Islamic Summit on Sunday. The special summit, initiated by the Kingdom of Saudi Arabia (KSA), brought together members of the Arab League, the Organisation of Islamic Cooperation (OIC), of which Guyana has been a member since 1998, and the president of the United States, Donald Trump. This was Granger’s second visit to KSA since he took office in 2015, but this visit to the kingdom comes at a very special time for Guyana. According to the New York Times, “Guyana is poised to become the next big oil producer in the Western Hemisphere, attracting the attention and investment dollars of some of the biggest oil companies” like Exxon-Mobil. Granger is going to Riyadh this time with much more political and economic leverage.